I'm mixed race. My father is white and traces his ancestors back to many European countries. My mother is from the Tlingit tribe of Southeast Alaska. Growing up, I knew nobody but myself, my brother and my mother who was Native Alaskan. Nobody outside our small family could even pronounce 'Tlingit' correctly. It was difficult growing up. Perhaps it would have been different if I grew up in say, Juneau, which has a large population of my mother's family and other Native Alaskans? I'll never know. I predominantly lived and went to school in all-white communities. In my elementary school there were 4 children of colour. Me, my brother, a black girl and a half-Korean girl. In a sea of white faces. Things were marginally different in middle school and high school. But nevertheless, I was still picked on incessantly because of my race. I was mistaken for Mexican quite a lot and had several racist nicknames that I was known by. My (white) dad picked me up once from a sports practice and he was told 'there is no way that YOU are the father of THIS child' and I cried. I remember being 7 or 8 in the shower and I was scrubbing at my skin viciously in the hopes that if I scraped away the dirty brown layer of my skin, I'd be pinky white (and therefore beautiful) like all the other children. Every where I looked I saw white faces. And everything, from the way I was treated by other children and books and TV and films and magazines, they all made me feel like white was best and white was beautiful. It was confusing. 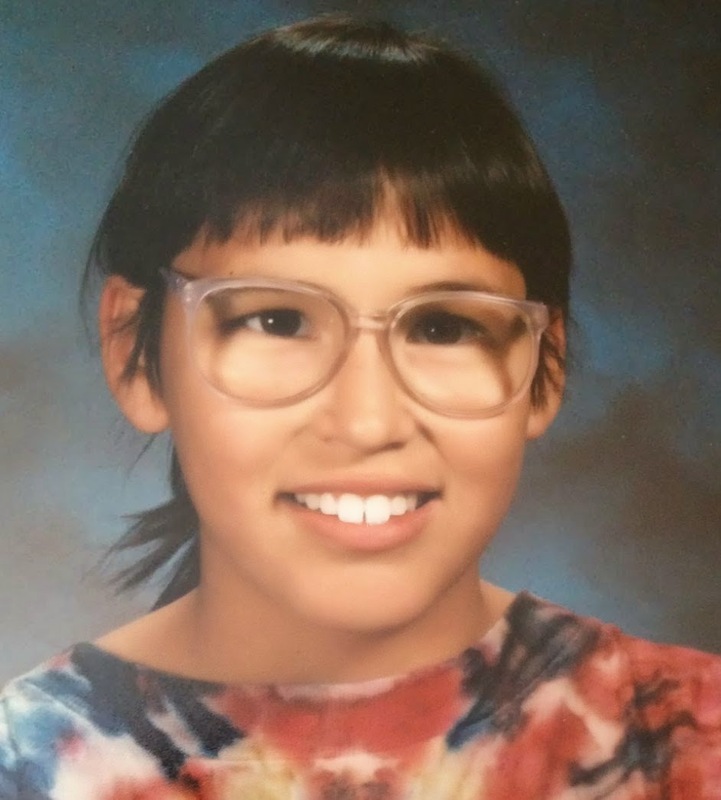 I always felt like I had to choose between being white and being Native Alaskan and because of my skin colour, white was taken out of the running. But with my mother having left at a young age, I didn't know anything about what it meant to be Native Alaskan. There were some places I could go to learn arts and crafts of other Native Americans. But the difference between being Cherokee (for instance) and being Tlingit is immense. Our two lives and cultures and experiences are not the same and are not interchangeable. And throughout these years of bullying, and name-calling, I did turn to books for comfort and escape. But the books I was reading never told my story. They were mostly about white, middle class boys and girls struggling with things that felt alien to me. I never did find any books about mixed race bookish girls who didn't fit in with other girls and was picked on and felt confused about her heritage and where she fit into the world. I did find some books about Native Americans. They did exist even back when I was a young child. But they were mostly incredibly problematic. A lot of them were about finding out more about the white people's religion or culture and how that was superior to their own or about falling in love and changing who they were to suit someone else's needs. These weren't the type of books I felt okay with reading. I wanted bold, empowering stories about girls who were different. And I didn't realise it at the time, but I think that's why I fell so in love with books and stories and memoirs about Jewish people during WWII. It started with Anne Frank and I went on to read anything else about Jews during this period of time that I could get my hands on. I can see now that I was empathising with Jewish people - they were different and being persecuted for being different but there were so many stories of people from all backgrounds and beliefs that fought in that struggle together. And I think that's what I always wanted for myself. I wanted to see people fighting for me, telling me it was okay to be different. That it was okay to be myself. I don't remember the first book that I read that featured a mixed race main character. But I know that I cried when I read that first book. And I know that it only happened to me as an adult reader. I still sometimes cry when I read books about mixed race characters. Because it's something so important to me. Even now. Always. In fact, reading this quote made me cry. It made me cry when I first read it and just now when I read it again to include it in this blog post. Because that's exactly what it felt like growing up and seeing no reflection of myself in anything. I felt like there must be something wrong with me. And that's why I think diversity matters. Let's have more mixed race characters in books and more diversity and let's not leave behind those children without any reflection. Let's let them know that they matter and that it's okay to be whoever we are. Great post, Michelle. Beautifully put. Thank you for sharing this. It is a really good post, though it is v sad to read about your experiences. I am v glad now that I put a mixed race character in my next book for 5-8 year olds - her name is Sita, her dad is Asian, her mum is white, and I have just had a discussion about the illustrations to make sure that this is clearly shown to the child reader, and sent your blog post to my publisher. We must change things. I don't want other children experiencing what you did - it's so unnecessary in this world - and the world of fiction can do something. Thank you again. Thanks, Anne! Your comment made me cry (today is a day for crying it seems!) I love the sound of your new book for children. Thank you for including a mixed race character. It makes me happy knowing that things are changing and that children now might be having vastly different experiences than I did growing up! Stunning post, Michelle. Thank you so much for this. Thanks, George. I'm a bit floored by everyone's responses! Such a beautiful post. I'm so sorry about your experiences growing up, no child (or person) should be made to feel monstrous or wrong because of the colour of their skin or their heritage. I'm so, so glad that diverse books are creeping in, that there are viewpoints being offered in fiction now from so many characters, rather than just the stereotypical white middle class ones. Diversity in fiction is so important, and your stories serve to highlight this fact even more. Thank you for sharing. Wow, a fantastic post, Michelle - thank you for posting it. Thanks, Jim! It was scary before I posted it but now that I have and have had such great support, I'm glad that I did. It feels kind of like a relief to share. Brilliant post. That quote about reflections is so spot on. Thanks, Jax. And yes. That quote says it all. This is a great post and Junot Diaz's quote is stunning. I think a lot of people agree that there should be more diversity but aren't exactly sure as to why apart from 'why not'. It's stories like yours that make people understand why diversity matters so much! Thanks for sharing your story with us, I'm sure it must've been difficult! Thank you so much for that lovely, supportive comment, Juli! It was difficult but I also felt like it needed to be written. Yes, more diverse books. I'm mixed too as is my husband. I feel you. Such and honest and beautiful post Michelle. Thank you for sharing. Wow!!! Awwww Michelle. I understand. I've experienced such. Sad because we are all human beings composed of the same matter.